I have heard from many successfull Internet marketers one of the most important online proverbs which says “The Money is in the List”. Many bussinesses that have started focusing more on building lists have revealed that the email list is indeed a powerful tool. There are numerous “Email list – building tactics” all over the internet that promise gazillions of subscribers with little effort, but this post is not about what the best strategies to build your email list are, is about one of the most important tools when building your list: Autoresponders. Autoresponders and email marketing in general are essential for your business. You use it to follow-up with customers, build loyalty, make sales and keep people coming back to your site. 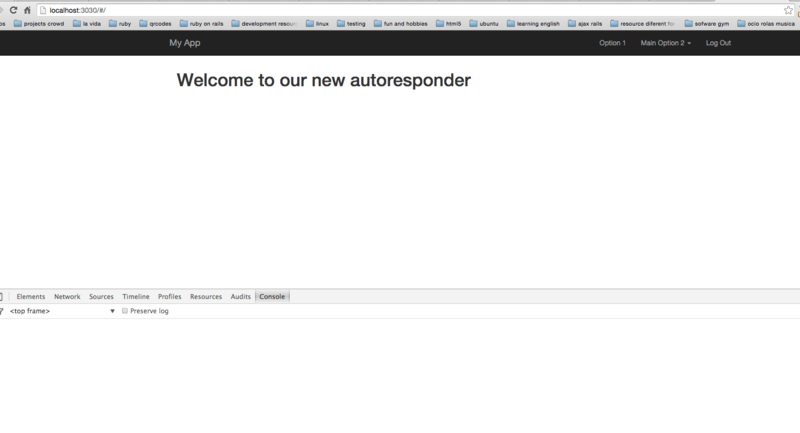 In this set of tutorials we are going to create our own Single Page Application Autoresponder which uses authentication and permission roles with Devise and CanCanCan using Rails 4.2 and Angular.js 1.4, and the best part, it will never reload/refresh. – Bower: A package manager for the web. – Rails-Assets.org: The solution to assets management in Rails. Rails assets as an asset manager instead of Bower. Let’s get right to create our rails app from scratch! I will not use turbolinks and you won’t either, so let’s remove the turbolinks from the Gemfile and the application.js as well. Instead of using Angular $http is preferable to use Restangular. For this tutorial we are using Haml. // Use $urlRouterProvider to configure any redirects (when) and invalid urls (otherwise). / [if gt IE 8]><! Hope you learned with this post, see you next time.